I've been gaming for a long time. Forever, really. I always loved board games more than video games or computer games. While I owned a Sinclair Spectrum (oh, yes), and eventually upgraded to an Amiga, before getting one of those new-fangled Mega Drives, it was always board games that captured my imagination. I guess, part of the reason, is because I have always been creative. From my perspective as a writer, a board game is a framework of rules that allows you to create your own story. By contrast, a video game is a framework of rules that allows you to star in someone else's story. Back in the good old days, Parker Brothers, Waddingtons, and MB gave me exciting worlds to explore, and stories to tell. But over time, I felt the lure of Games Workshop, and I progressed into the dark realm of brutal fantasy and grim-dark science fiction. And then I went to the brutal and grim-dark world of university, and everything changed. Or at least, I thought it had. I thought I was supposed to grow up, and so I sold everything. Every game I owned. But when I finished university, I realised something hadn't changed at all... me. I still had that itch to explore fantastic worlds. I was still a gamer. So, I gradually started a new collection. I discovered a site called BoardGameGeek, and it introduced me to new companies, new brands, and new ways to play with cards and dice. I was voracious in the beginning. I pounced on every style and genre, looking for mechanisms I found fascinating, and immersive themes. I played lots of games I loved, lots I hated, and more than a few that I didn't really care for one way or the other. And it was a learning experience. I learned a lot about me, and about how I like to interact with other people. I learned I really, really like co-operative games. 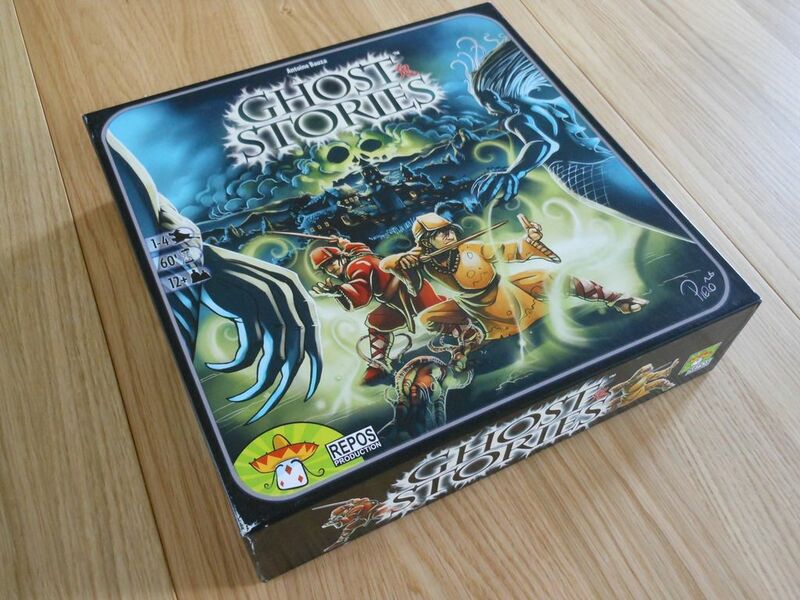 And of all the co-operative games I own, Ghost Stories is one of the very best. I originally reviewed it on BoardGameGeek back in April 2009, but I'm a writer, and I am cursed with the writer's constant desire to do better. I look at reviews from a few years ago, and I think, "What hack wrote this?" I will probably think that about this very article within a month. And so, every now and again, I like to revisit a game. Sometimes it's because my opinion has changed, but mainly it's because I know I can do better. Ghost Stories is an exceptionally beautiful game, crammed with full-colour board tiles, player boards, plastic miniatures, and thick tokens. But for all that, it is predominantly a game about cards. A single deck of cards, in fact. Cards that want to kill you. So, I'm going to start by putting my cards on the table. 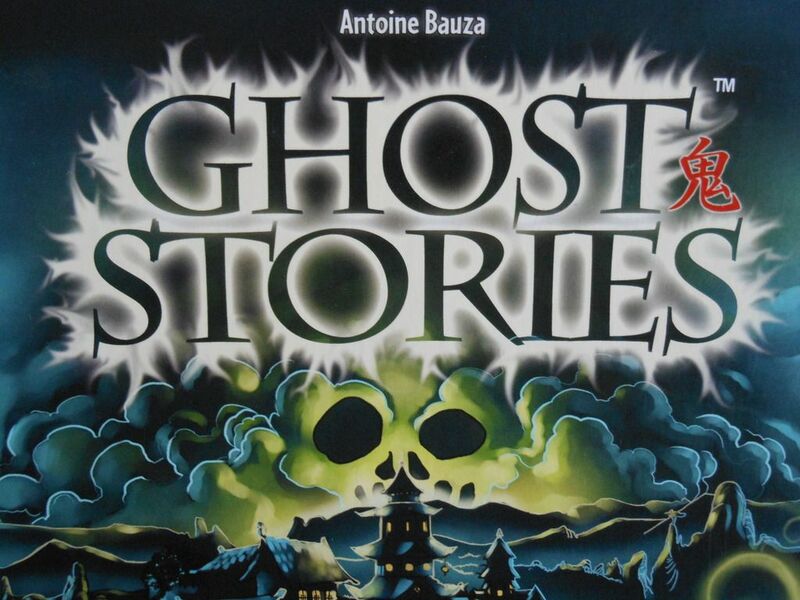 At the time of its release, Ghost Stories was one of the finest co-operative games on the market, and it still is, even though it's about 70 years old in board game years (which are roughly equivalent to dog years, but not nearly as kind). So, what's it all about, and why should you like it as much as I do? To be honest, there are probably more reasons to like the game than there are components in the box. The whole thing is a little miracle of compact design. The premise is simple (four monks protect a village from marauding ghosts), the rules even simpler (use a combination of coloured tokens and custom dice results to match the colours of the attacking ghosts). You can learn the rules and start playing in a matter of minutes. But when you master the game... if you master the game... is another matter entirely. To get started, each player selects a little Taoist monk playing piece. 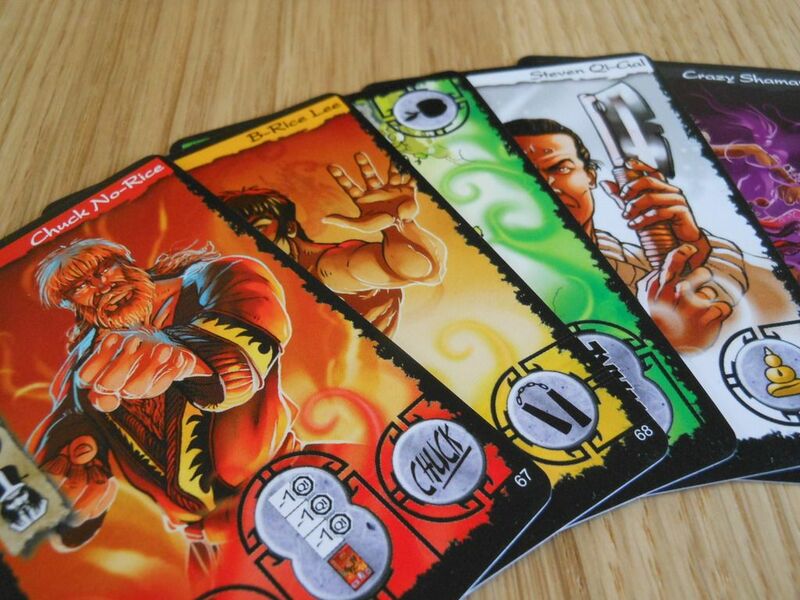 The monks come in four different colours, and each one has two unique powers (although you only get one for each game). The powers define a purpose for each monk, ensuring every player has something valid to contribute. 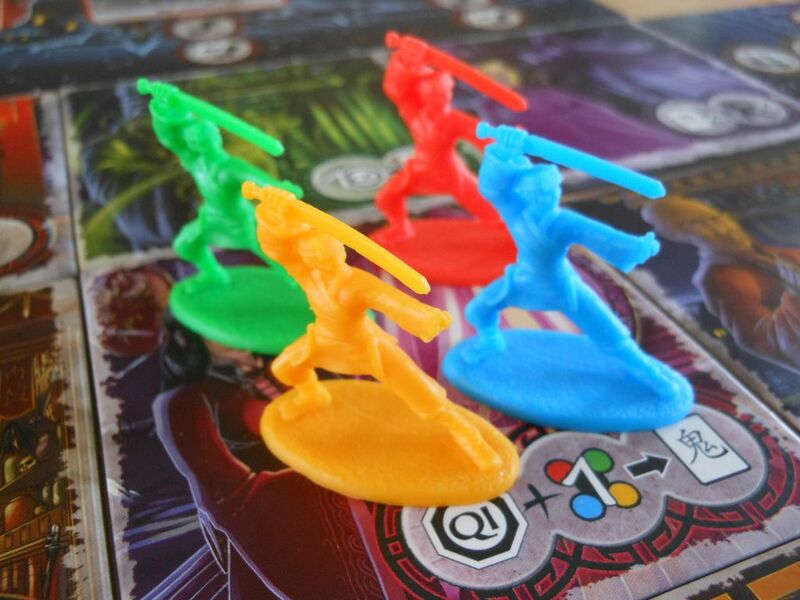 The red monk has two powers that affect movement, the yellow monk has two powers that make it easier to use Tao tokens to banish ghosts, the blue monk has two powers that allow him to perform multiple actions in a single turn, and the green monk has two powers that allow him to manipulate dice. Every monk feels like a valid choice, and if you play with less than four players, you will definitely miss the monks that aren't in play. There's always a moment where you regret your choice, and feel a monk's absence as an impossibly large gap in your defensive formation. Next, you shuffle nine village tiles and lay them out in a three by three grid. Each tile offers the monks a different benefit; but taking advantage of those benefits often triggers a negative event, creating agonising decisions where you balance risks and rewards. For example, do you want to use the sorcerer to banish a ghost, knowing that the magical power requires a blood sacrifice, costing you one of your valuable Qi (life points) as payment? The answer is, "Yes, yes you do... Until you don't. But even then you still do. Maybe." After setting up the village, you place one monk playing board along each edge of the grid (even if there are less than four monks taking part). These boards describe each monk's unique ability for that game, and also have spaces for positioning the ghosts that come into play. Finally, you shuffle a deck of ghost cards laced with a number of Wu Feng incarnations. Wu Feng is the "big bad" leading the undead army, and the ghost you must banish to win the game and save the village from the never-ending wave of monstrosities. This setup process provides essential variability, because "Ghost Stories" is something of a misnomer. This is not a scenario-driven adventure game; it's a puzzle with one basic "tower-defence" style scenario. Ghosts move toward the village, and you have to stop them before they get there. However, by playing with different numbers of monks, different combinations of player powers, different village layouts, and different quantities and types of Wu Feng cards, it's possible for the game to present a new challenge every time. And by "challenge," I mean "way to brutally murder you." But more on that in a moment. The game play is simple. Deceptively so. To hear it explained, you might mistake this for a baby's colour-matching game. But before I get into all that, I thought I would spend a few minutes talking about theme. I am really funny when it comes to theme. I love games with theme, but that theme doesn't have to be perfect, and in some cases it may be pasted on liberally with the very broadest of brushes. Warhammer Quest: Silver Tower and Fireteam Zero are dripping with theme. They ooze so much theme it's a wonder you don't need to handle the boxes wearing protective gloves. If the themes were different, I probably wouldn't like the games quite as much, but they are what they are and I love them for it. I enjoy abstract games too, but they still have to have a theme of some kind. Hive is a good example. Hive is a completely abstract game, but because the pieces are based on different bugs, and because the pieces move in ways that reflect (to a certain degree) how those bugs would behave in the real world, it works for me. Would I like Hive if the pieces were just different coloured blocks? 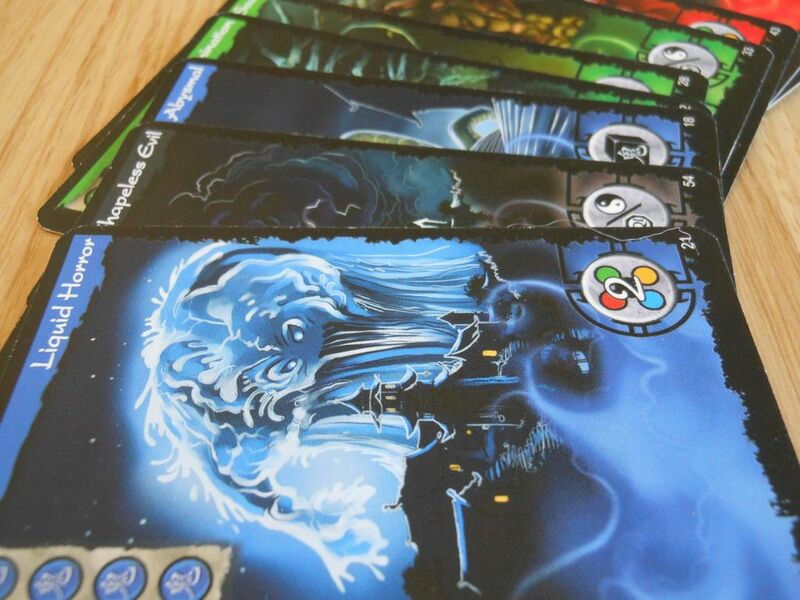 When it comes to theme, Ghost Stories is not really like any other game I have played. It's a relatively abstract game about resource optimisation and risk assessment, but it's smothered in a tangy cheesy theme about Taoist monks defending a village from an onslaught of ghosts. The thing is, once you start playing, all that delicious cheese theme just melts away. This game is a big puzzle. After a while you stop seeing ghosts as "ghosts" and you start seeing them as a piece of the puzzle that you need to solve. Don't get me wrong, the theme is still there on every beautifully illustrated card and every playing piece. It just becomes transparent; as ephemeral as a lost spirit. It's like Bruce Lee once told me: This game is a bit like a finger pointing into the sky. If you focus too hard on the finger, on the driving mechanisms of the game, then you miss all the heavenly glory. But in the moments when you look away, when you pause to think, when you step back from the table... Well... It's all there. And it's beautiful. And, once you stop to think about it, you realise the theme permeates the very mechanisms of the game. There is a yin-yang sense of balance that's prevalent through every aspect of the design, integrated seamlessly. It's in the structured ebb and flow of each turn, it's in the risk-reward decisions you make, and it's in the joy and despair that comes from the placement of each new ghost that brings you closer to victory while also bringing you closer to defeat. It's a theme you can't see: A thematic spirit. On your turn you first check to see if your player board is full of ghosts. If it is, you lose one Qi point (this is bad), but you don't have to draw a new ghost (this is good). If your player board has at least one space, you don't lose a Qi point (this is good), but you must draw a new ghost (this is bad). Each ghost has a colour, and you must place that ghost on the monk playing board of the matching colour (not necessarily your own board). If there is no space you get to choose where to place the ghost, which is good because it means you get some extra control, but it's also bad, because it means at least one player board is already overrun. Oh, and if the ghost is black, you have to place that ghost on your own board. Some ghosts creep towards the village at the start of each subsequent turn and eventually haunt spaces, some make the monks roll a special curse dice that does bad things like steals Tao tokens or haunts a village space or summons a ghost, and some just sit there filling up the board. All this ghost activity represents yin. After that, you get to take control of your monk. This involves moving one space (or more if your monk has a power that allows it) and then either using the village space the monk is on, or attempting to banish one or more adjacent ghosts. 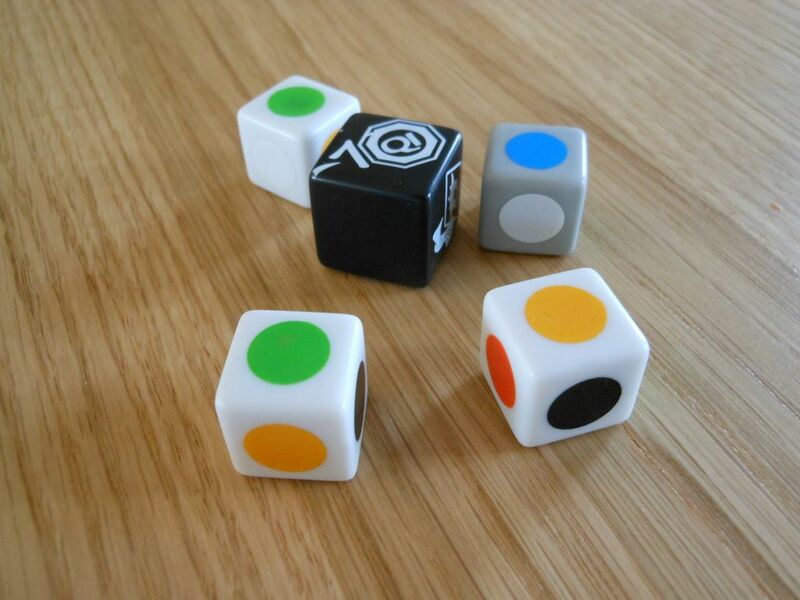 Banishing a ghost involves rolling dice with coloured sides to attempt to match the ghost's resistance, supplementing the roll with Tao tokens of the right colour where required. For example, to banish a ghost with a resistance of two yellow, you could roll one yellow symbol and then pay one yellow Tao token to make a total of two. Banishing a ghost often has a negative affect, such as making you roll the curse dice. The monk activity represents yang. Matching the colours to banish ghosts is the main reason why the seemingly rich theme starts to become transparent as the game plays out. To begin with, you will draw a card and say "Oh no, a zombie with resistance of one yellow" (or something that sounds a bit more natural and probably has a swear word in it); but after a few cards you will be saying, "Blue thing with resistance three," and eventually you will be saying, "I need two greens." This transparency of theme is heightened as there is no text in the game. Special powers are represented by a symbol, the abilities of ghosts are represented by symbols, the abilities on village spaces are represented by symbols. There is no flavour text on anything except the reference sheet that tells you what each village space does. I don't mind the lack of flavour text - the symbols make the game quick to learn and quicker to play - but some people may miss reading out fun descriptions of the different ghosts. Now, what I've just described is pretty much the sum total of the game. It's all that simple. They are the only ghosts that get little plastic figures, and they are suitably unsettling. At the start of each player turn (EVERY player turn) they take a step closer to the village. If they reach a village tile, they haunt that tile. That means the monks are no longer able to use the benefit of that particular space; but more importantly, it also means the monks are one step closer to failure, as the game is over if four locations are haunted. I particularly like the haunting mechanism. It's incredibly tense, putting you under immense pressure to deal with a (not so) slowly advancing threat; and while failing to prevent a haunting is not the end of the world, it feels suitably devastating. Best of all, you get to flip over the location tile. That may not sound like much, but the tiles are double-sided. One side depicts the location and the villager who lives there, while the reverse shows the same location, but the villager is gone, and there is ghostly mist circling around everything. It's a nice touch that ties the components to the theme and maintains an eerie mood. So, haunters haunt, ghosts linger, monks burn Qi points, Tao tokens, and even their precious yin-yang tokens to fend of the assault. Things get bad. Then they get worse. Then they get even badder and worser. And then the monks lose. But more on that in a minute. The repetitive nature of the game may sound dull, or limited, but it really isn't. Working out combinations of village powers and monk powers to keep the advancing hordes at bay is huge amounts of fun, and as more ghosts arrive it gets really exciting. I haven't felt so tense during a game since playing rapsies at school. And there is good reason to be tense, because this game is tougher than that kid at school who always used to make you play rapsies. There are four levels of difficulty. They start at hard and end when all your hair falls out. This might put people off, but don't let it. A good trick is to play a few solo games to learn tactics, and then there's a better chance of you winning. Because in truth, playing with less than four players is a slightly different experience. There always has to be four coloured playing boards around the edge of the village, even if there isn't a player of that colour. If there is at least one board with no player for it, then the other players get special power tokens (one each, unless you are playing solo, in which case you get three). At any point, a player can play a power token to use the power of any board that does not have an active player associated with it. So, if there was no blue player, you could play a power token to use the blue monk power. 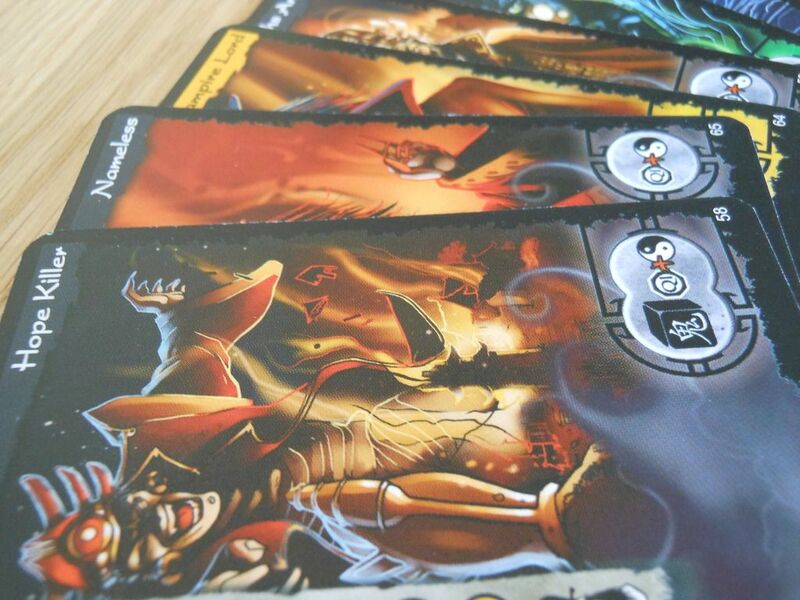 Used power tokens go to the central village space, and a player can use his or her action in a turn to retrieve them. These power tokens add an extra level of strategy and really change up the way the game plays. But overall, this is a very simple game. It's one of those rare and beautiful experiences that minimizes the clutter, eradicates fiddly mechanisms and exceptions to the flow of play, and allows you to focus on the actual game without constantly referencing the rules. However, despite being simple to learn, there are lots of different tactics to master and power combinations to work out. In fact, despite the release of several expansions over the years, I have never felt the need to buy any of them (although a friend did buy me some of the extra Wu Feng incarnations and a new village tile). This is a game that feels complete. It's whole: A perfect circle of yin and yang. And part of the reason it feels so complete is because of the challenge it provides. At the most difficult levels, it's an eye-watering, arse-puckering experience that doesn't let up for a second. Calling it hard is an understatement. But if you lose, you'll want to play again. Because the game's also fair. If you lost, it's because YOU lost; not because the game tricked you. So you'll play again. You'll play again, because just like me writing my reviews, you know you can always do better. You know you can be better. And on that note, I'm signing off. I need to go and unwrap a ghost of Christmas present. Ghost Stories isn't the easiest game to find, but there are copies available on Amazon and eBay, and you may find it at your local game store. Haha its funny how you define the differences between board and videogames, by how much the story is fixed, or instead, defined by your actions. I agree with that completely, but I think the games you usually talk about are actually those with a more rigid narrative. I find that eurogames (those that aren't just about optimizing resources) are usually more open regarding the "story" of the game, even if that story is very thin and the theme is not that strong. By comparison, thematic games like Mansions of Madness, Consulting Detective, etc, have usually predefined stories that the game forces upon you, and it just lets you be the star like you said about videogames. An interesting point view, nonetheless. Fantastic game, by the way, and a fantastic review too, as always. It's interesting you mentioned Mansions of Madness, because one of my complaints about that game is that it is too restrictive in its desire to tell a story. I said elsewhere "it tries so hard to paint a picture, it forgets to let the player hold the brush." 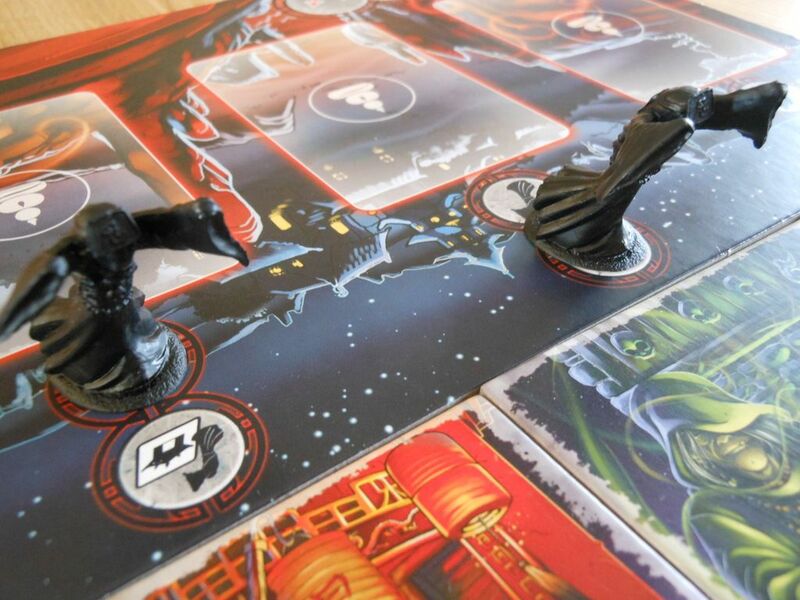 In general, I think (even on a simple level) board games offer more potential for story than many video games. You can play the first mission in Silver Tower many times, and every time is different due to the variability of choice of characters, the order of the map tiles, the random events, the ambushes, the types of monsters you meet, and the decisions you make. Those elements often combine in fascinating ways, to create memorable moments of story that I just don't feel like I get when I come away from playing a video game. However, for me the power of board games goes beyond the narrative, as they also provide the potential to create something much bigger than what the designer initially provided, both in terms of expanding the story and creating your own content. I remember playing the original HeroQuest, and fleshing out the storyline. I knew the history of my barbarian. And then I started making my own missions, using the building blocks the designer had provided to create my own world of adventure. Later, games like Warhammer Quest defined the concept of the board game as a sandbox: I could buy whatever models I wanted, populate my dungeons however I chose. I could search randomly generated tombs, or create an epic adventure. I could do whatever I felt like doing. It gave me a sense of complete freedom: A way to enjoy my hobby any way I wanted to. That sense of freedom is something I still experience with modern games, even those games where the narrative is relatively rigid. Ultimately, board games are tool kits for the imagination; and part of that is because you have to use your imagination. The scenes aren't happening on your flatscreen television in high-definition. Thanks again for taking the time to read and giving your thoughts. One of my favorite games. I was a fan of the hopping vampire and magic kung fu genres of films for decades before the game came out. When I first discovered the game, it was like it was made for me. One of my favourite films as a child (which says a lot about me as a child) was The Legend of the 7 Golden Vampires. So yeah... Chances were good I was going to love this game.